To stay up to date on upcoming TLN events, sign up for the local newsletter! 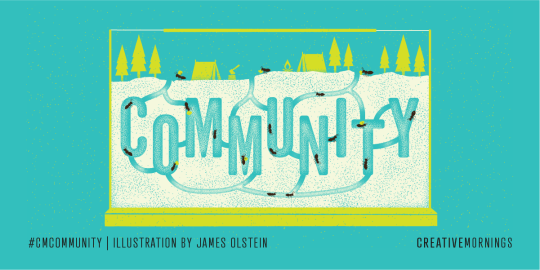 A community is a reflection of what we crave: belonging. Belonging is the heart of human connection. Our hardwiring is to be social creatures, to need one another. We cannot become our best selves without feeling like we belong to a tribe that sees us, respects us, and lifts us up. A sense of belonging can be fostered in many ways: food, music, volunteering, a cause. You can scan a room and see a diversity of backgrounds, ages, and skill sets—yet the common thread is shared desires and aspirations. It’s magnificently profound how simple this connection is, how deeply we all crave it, and how it changes the trajectory of our lives. The work of community is when a person walks into a room with fear and self-doubt, only to leave with a new narrative and a feeling of possibility and hope. We can give that experience to one another. It’s the work of being human. 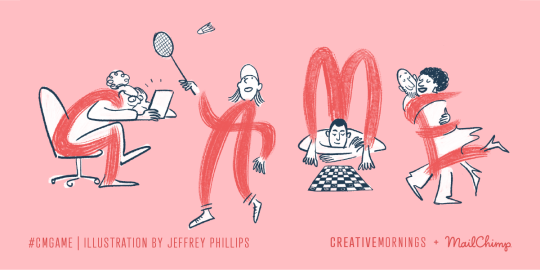 This month’s global exploration of Community was chosen by our Philadelphia chapter, and illustrated by James Olstein 👋 High five to MailChimp, Adobe, and WordPress.com for fueling our global creative community. Throughout human history, games were about winning or losing.Author James P. Carse extends this concept beautifully in Finite and Infinite Games: “A finite game is played for the purpose of winning, an infinite game for the purpose of continuing the play.”Which game are you playing with your art?It’s a question worth asking everyday. Is this decision, this attitude, sending you down a short game or long game? The same energy that we spend chasing rewards and likes can be refocused to loving our craft and shipping our best work.Keep your eyes on the journey, not the prize.This month is presented by our global partner MailChimp. This month’s global exploration of Game was chosen by our Liège chapter and illustrated by Jeffrey Phillips. When researching or writing about courage, other traits fall into the mix: risk, vulnerability, curiosity, empathy, and action.It seems, then, that courage has nothing to do with your title or level of expertise. It’s not for the few or the gifted. It’s an act of humanity, of choosing to take an action that is risky because it demands vulnerability and curiosity.Courage has no specific form and knows no bounds. 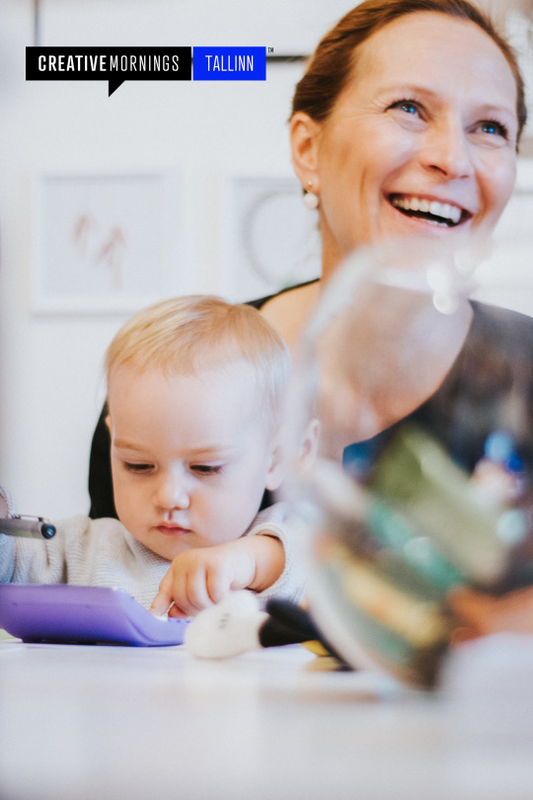 From starting a side project to the act of listening when you would rather interject, every day we are wrapped in opportunities to exercise courage.We need your courage. It’s going to be risky and will require vulnerability. A posture of empathy and curiosity will empower you. 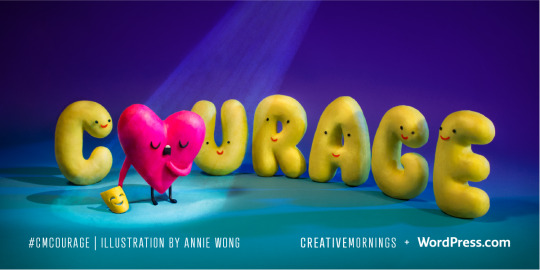 And above all, you must take action.This month is presented by our global partner WordPress.comThis month’s global exploration of Courage was chosen by our Oakland chapter and illustrated by Annie Wong. Death has inspired humanity since time immemorial, influencing ideologies and storytelling to our understanding of life and how we live it.To our ancient ancestors, the fear of death was a palpable and daily motivator. Although our world is infinitely safer than it was centuries ago, we are still driven by the fear of death and we expertly attribute it to even the smallest events: traffic, deadlines, a mistake, public speaking, your boss’s name on your caller ID on a Saturday. What we have done well as a species is leverage the fear of death to inspire achievements that seemed impossible, to create work that needed to be made and to discover insights that help us live well. 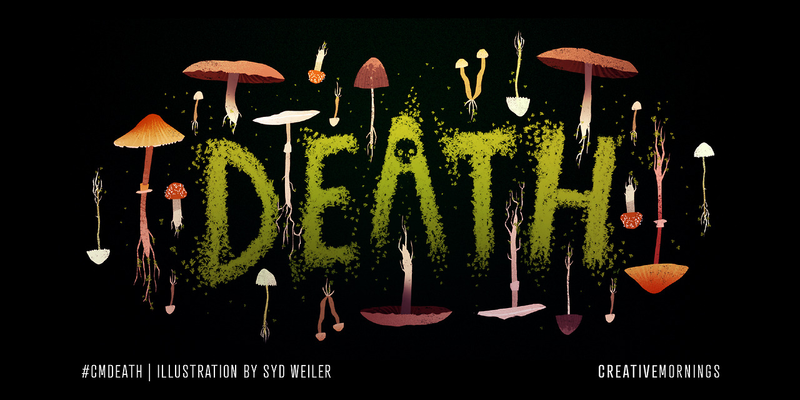 This month’s global exploration of Death was chosen by our Miami chapter and illustrated by 2016 Adobe Creative Resident Syd Weiler. Thank you to our global partners — Adobe, MailChimp, WordPress.com, and Shutterstock — for their support. It was all very much an organic process. At first I did not set out to create a brand or a business – I just found the process of jewellery making therapeutic and I was excited to make exactly the kind of pieces I wanted to wear. But people started approaching me and often asked about the pieces I was wearing, so I started to play with the idea of making jewellery for others as well. And since I have an MBA in marketing, then it was natural to include my story and vision into all my pieces. Not to just make something but to try and create a whole “NV World”. So, how have you discovered a passion for designing the jewellery? It was all wonderfully accidental. I have never been into arts and crafts stuff. So when years ago my two friends (one a very much arts and crafts type of person and the other a jeweller) invited me to come and just hang out and maybe make some stuff together. Well, I said we can try but I don’t think I will like it. And boy, was I wrong! When I actually sat down with all the wonderful stones (the different colours, textures, etc) and they had shown me the very basics of how to make a necklace or bracelet. Well, then I suddenly discovered how much I really enjoyed getting out of my own “headspace” and into a much more limitless world of creativity. How did you come to launching a business in the jewellery? Before committing myself entirely to jewellery making, I did test it out. I had a “real” job and on my free time I would make pieces, develop my brand, search for the perfect packaging, etc. At the same time I was also determined to not loose the joy of making jewellery, not to be in a position where I have to worry about selling it. Hence I would work to finance my life and my newly found passion- I had a saying that I make pieces that I really love and if someone else loves them just as much, well that is a bonus! But fortunately things developed quite fast and after two years I was at the crossroads – it was a big decision for me to invest all my time and effort into just jewellery making. I am thankful for my own courage to step out of the comfort zone and to take a chance on myself. What are the challenges in the profession of a jewellery designer? I think it is not just jewellery making, but whenever you take a leap into something new it is scary. Basically, you jump with your head or for the more levelheaded person feet first into the unknown water – and that takes courage, determination and resilience. At the beginning, it is definitely putting yourself out there, which in turn makes you more vulnerable – because people will react and sometimes the reactions are supportive and other times they are not. I guess at first that is the biggest challenge - to take feedback but keep focusing on your own inner voice as well. The second challenge I would say is understanding the market, the new environment. I did research, but a lot of the decision making was very fast paced and often it was based more on my gut feeling. The third challenge is the legal part. 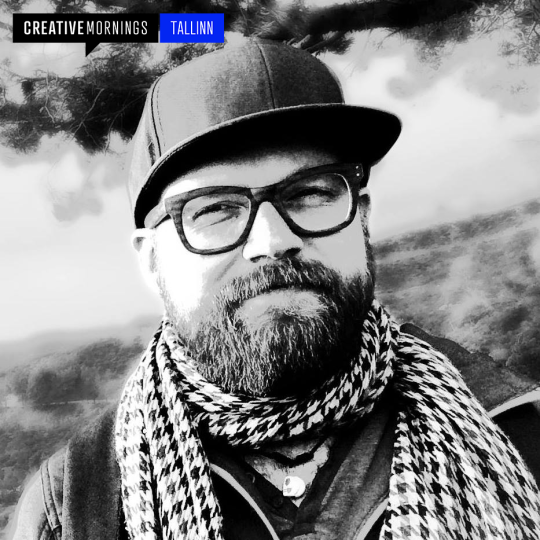 It is just something that isn’t often talked about in the creative industry. My big lesson has been that if you come up with something unique, then do try to protect that idea, product as best as you can. Of course, here the list continues indefinitely- since I am learning something new and challenging almost on a daily basis. But for the most part, I love it - it keeps me on my toes! The most valuable lesson you have learned when being jewellery designer? Dream big, work hard and be kind to yourself. 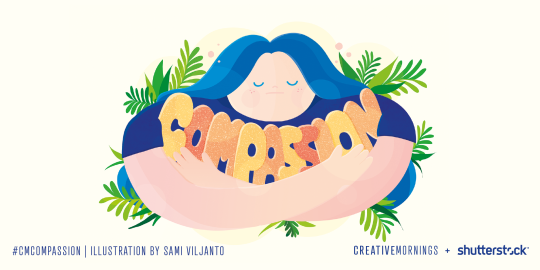 This month’s global exploration of Compassion is chosen by our Helsinki chapter, illustrated by Sami Viljanto, and presented by @shutterstock. If you unpack this centuries-old label, you might realize that the posture of a genius is already baked into your daily routines. 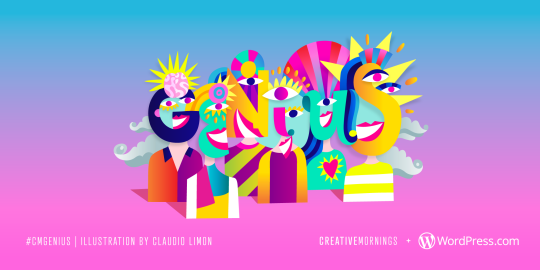 Geniuses are exceptional at failing, learning from mistakes, and cross-pollinating insights from various domains. They’re working, not for money or fame, but because they’re compelled to pursue a particular craft or interest; they’re obsessed; they cannot look do anything else other than solve the problem, paint on that canvas, or breathe life into an idea. 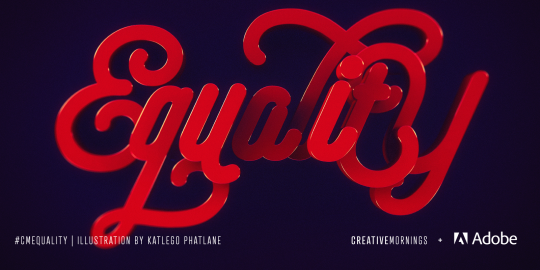 This month’s global exploration of Equality is chosen by our Johannesburgchapter, illustrated by Katt Phatlane, and presented by… Adobe! Yes, you read that correctly. 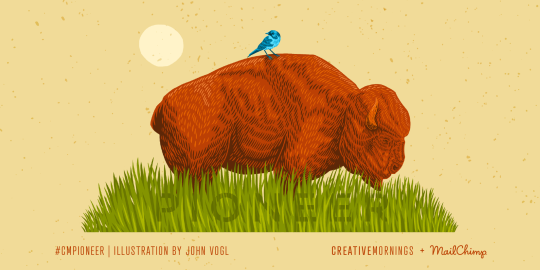 - How did you get into content marketing work? It all happened because of my wish to tell stories. It actually started about 10 years ago, when I worked at the Estonian Business Daily Äripäev in the creative news department. At that time the revolution of the web had just started and I fell in love with all the possibilities to tell stories in that new way. We created the first video news story in Äripäev and also the first complex multimedia story with videos and picture stories and everything. Today it’s, of course, nothing but at that time it was a totally new approach. But in terms of turning a profit, it was expensive as hell. So when the creative news department at Äripäev was closed due to the recession I was too far gone down that new media rabbit hole that I just could not go back to just writing news. Instead, I left Äripäev and started working on my own to find ways to bring my stories alive in the new media world. And it did not take me long to figure out that the only way to do that is with branded money. So for me, it was never really about marketing… it was always about the story. - How would you define ’Survival?’ What does that mean to you? I used to do jiu-jitsu when I was young. I sucked at it. Every time I sparred I was taken down in a matter of seconds. And yet at that unfortunate position, I found something paramount - the importance of the ability to survive. Although getting me down in a lock hold might have been easy, getting me to surrender… well, that was a whole different story. Today as the director and producer of a seven-figure animated feature film “The Survivalist - Danger Island”, I am often reminded of those moments lying face down on that sweaty sparring matt, as looking back at this journey it has been nothing less than a trail of lock holds, where the only way out is simply not to give up. And that is exactly how I define “Survival” - it’s simply not giving up. - Was there a point in your career where you felt like you were just surviving? How did it impact your creativity? Oh…if I look back at my life I don’t see a trail of success. I see a trail of failures. So much so that I can’t even measure my successfulness by what I’ve done right, but by everything I have failed in. And the only way I know I am on the right track is through my failures getting gradually bigger. Because if they get bigger, that means that someone has trusted me with a bigger project. So in regard of that, I am unable to point out a specific place in my career where I felt like just surviving because to me it’s always just surviving. There is nor there ever will be a safe harbor, a summit or a finish in life. It’s all survival until the very end. And that survival does not just impact creativity, it IS creativity. Because creativity can’t be or come from a point of standing still. Creativity is what happens in endless unexpected collisions inside the storm of life. - What advice would you give to those, who want to build a career in marketing? Well. I guess the best advice I could give them is not to ask that questions from me (laugh). In all seriousness, I have never seen myself as a marketer. I have always seen myself as a storyteller. And I don’t mean that in a cheesy “trying to make a point” way. I mean it in a way that I never wanted to become a marketer or a branded entertainment specialist. I just wanted to build worlds and tell stories. But in order to do that there was no other way than diving neck deep into branded entertainment. So yeah, I do feel very much at home when it comes to content marketing and I truly love content marketing and all of my dreams literally come to life thanks to content marketing, but still I am the wrong person to ask that particular questions, because my goal was never to build a career in marketing. It was to build a career in storytelling. - Tell us something about yourself that we can’t find on Google. From the day I went to kindergarten until I was about 17 years old I was rejected by every girl I ever liked. I believe that to be the most significant factor in the development of my character because it is both the birthplace of most of my creativity as well as most of my anxieties (laugh).